The D3i has built-in features that support NEC’s enterprise-class storage software. A single D3 array is capable of scaling from just 219 GB to 144 TB capacity by adding up to eleven 2U 12-drive expansion enclosures. Aggregate throughput of over 400 MB/s to hosts is available through up to four 1 Gbps iSCSI Ethernet ports. These can be connected into a network or direct-connected as a simple, low-cost DAS configuration. (A Fibre Channel model is also available.) The disk enclosures are attached to the controller via SAS wide-link connection for 24 Gbps bandwidth to each disk enclosure. The D3i is fully redundant to protect against single-point-of-failure, with a battery backup unit for protecting the cache. Failed components are reported via alerts by either email or SNMP traps as well as in the management software. The D3 has built-in features that support NEC’s enterprise-class storage software. A single D3 array is capable of scaling from just 219 GB to 144 TB capacity by adding up to eleven 2U 12-drive expansion enclosures. Aggregate throughput of over 1,100 MB/s to hosts is available through up to twelve 4 Gbps Fibre Channel ports. These can be connected into a switched fabric SAN or direct-connected as a simple, low-cost DAS configuration. (An iSCSI model is also available.) The disk enclosures are attached to the controller via SAS wide-link connection for 24 Gbps bandwidth to each disk enclosure. The D3 is fully redundant to protect against single-point-of-failure, with a battery backup unit for protecting the cache. Failed components are reported via alerts by either email or SNMP traps as well as in the management software. The D4 SAN storage array provides both high performance 8 Gbps Fibre Channel ports and cost-effective 10 Gbps iSCSI connectivity in the same system for use with VMware®, databases, and other block-storage applications. 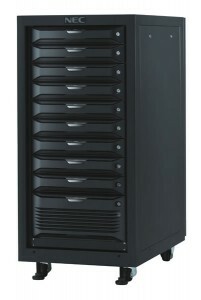 It uses both SATA and SAS drives in the same enclosures to create a tiered storage framework. Highly scalable from just 300GB up to 288TB capacity by adding up to eleven 2U 12-bay expansion chassis/arrays.